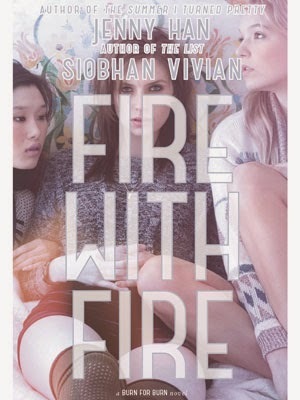 It's been awhile since I bought Fire with Fire, the second in Jenny Han and Siobhan Vivian's trilogy about teenage revenge. It's been sitting patiently on my Kindle, waiting for a good flight. Yesterday was the day and it was worth the wait. I was immediately plunged back into the world of Kat, Lillia, and Mary, all seeking revenge on the popular kids who've done them wrong. Looking back at my review of Burn for Burn, I really enjoyed the first in the series. The second ramps up the drama even more; everything is more intense and with bigger consequences. I love the subtle differences in the characters' chapters: Lillia describes what others are wearing, Kat uses slang and curses, and Mary seems completely disconnected. There is a surprising plot twist that reminds me of E. Lockhart's recent, brilliant We Were Here. It makes me want to reread the first two books in the series while I eagerly await the third, Ashes to Ashes, which will be released in September.